With our diabetes-management-software-SiDiary you can easily import data from your Ascensia Breeze/Breeze 2 blood glucose meter and use lots of advantages of statistical analysis; trend analysis and graphics to improve your therapy together with your doctor. For the data import from Ascensia Breeze/Breeze 2 a data cable is necessary, which you can order as an original manufacturer cable directly from an online-shop. For this you’ll need a serial Com-Port on your computer. If your computer does not support such a port, you’ll be able to use standard adapters for USB-to-Com. 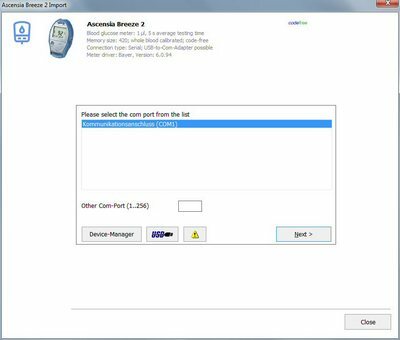 Here we have tested several USB-/Com-adapters, especially for Ascensia blood glucose meters.